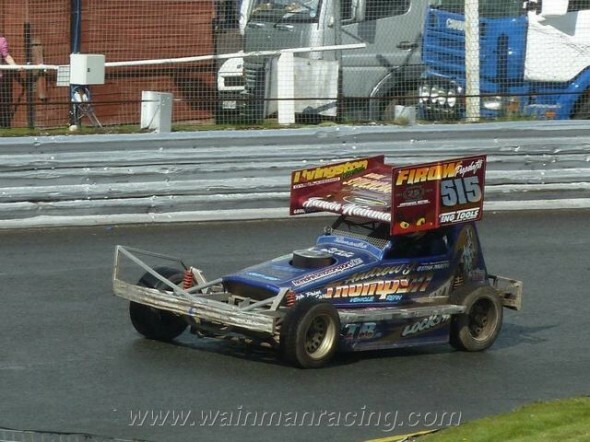 The following day we were racing at Hednesford. Seven of us slept on the truck after driving there straight from Birmingham. If I was to get any results today I needed the heavens to open! Thankfully for me it hammered down all day! Young Frank is also out in his Mini this afternoon. Like me, he likes wet conditions so he is happy too! The minis are on first. Frankie seems to be going well and is up to third place. He’s caught Camey up, next thing I know they are both out. Not sure what really happened? 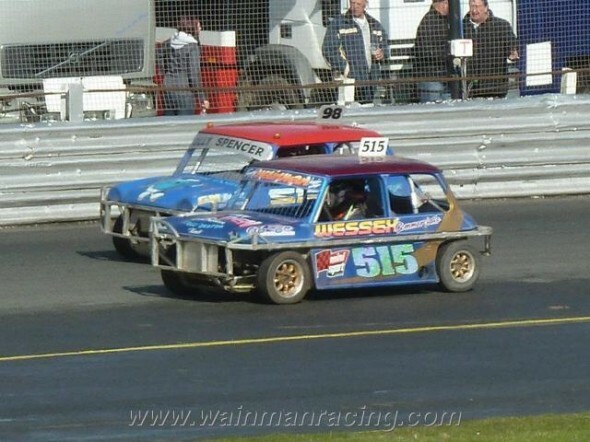 But Frankie’s steering was broken when he came back to the pits. 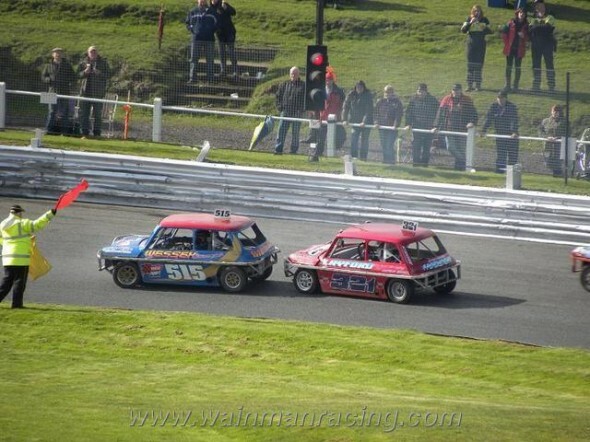 Thankfully they both got out for the next heat. Me and Dan are out now. The car feels good but the lower graders are hard to catch round here! Everything runs pretty smoothly. I went on to finish in fifth place and Danny eleventh. The minis are back on. Better luck needed in this one for JJ. He gets off to a good start and is up to fourth place before getting spun and not finishing. This means he hasn’t qualified for the final but can still participate starting off the back. Heat 2 for the F1s. 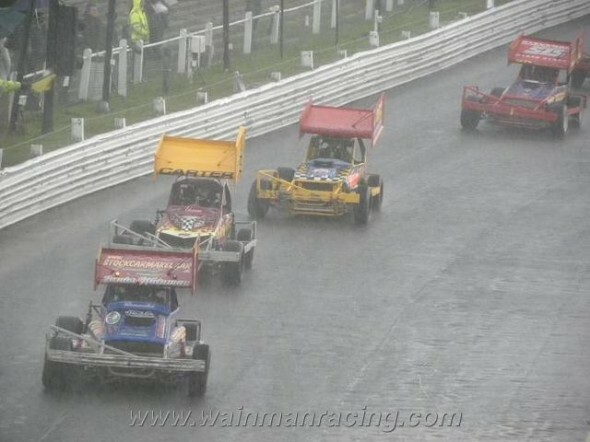 Another wet race. 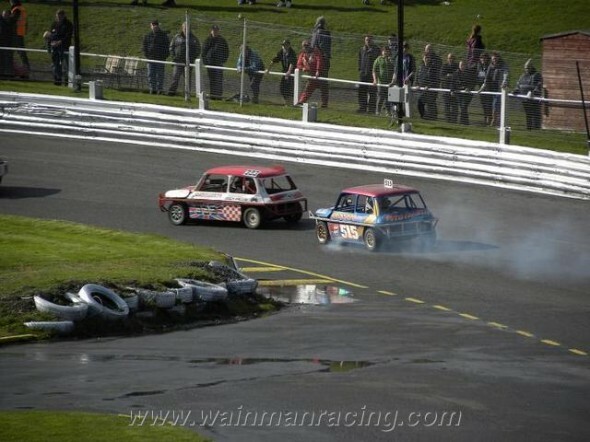 Danny was going well until his tyre blew and he went in pretty hard, my race goes well and I get third. The Mini kids are back out for their final. Frankie’s not too impressed about starting from the back but will have to get used to it! He gets off to a reasonable start, like the F1s the lower graders are hard to catch round here! Still, he does his best and gets eighth place. 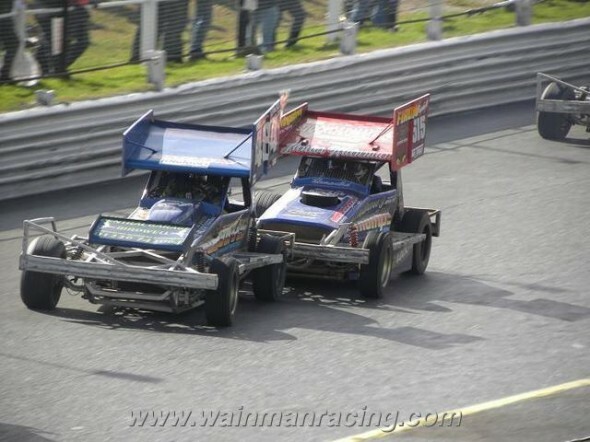 Us Wainman brothers get strapped in and are out for the final. After 8 laps I take a look ahead to see where everyone is? I spot Danny some distance ahead and he looks like he’s going really well! Then cruelly he gets another flipping blow out! 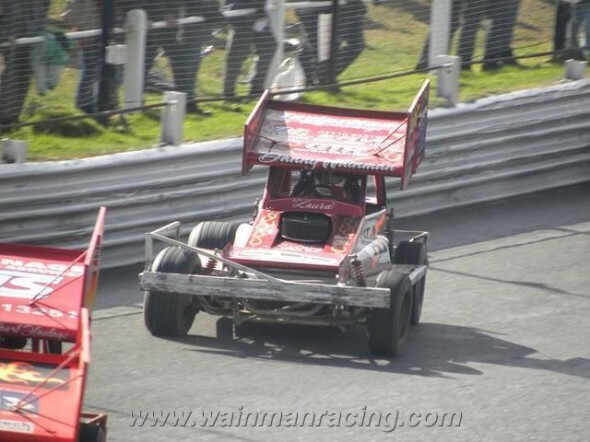 This stock car lark can be very frustrating and I feel peed off for him! I battle on and cross the line fifth. 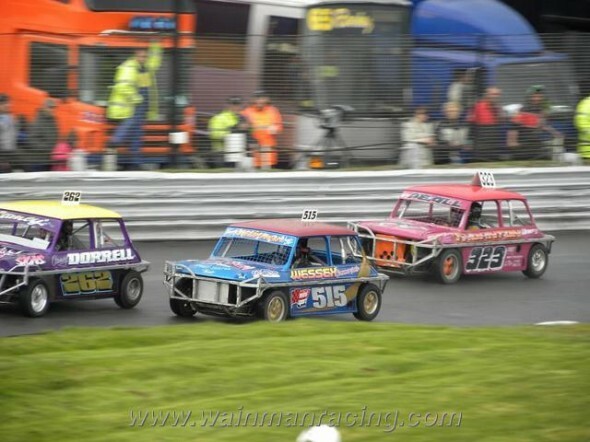 The last race for the minis is on. Frankie JJ can be quite hard on himself when he doesn’t have the best of meetings. 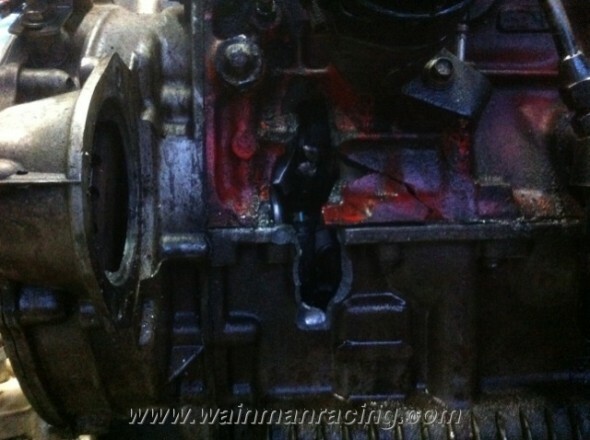 This showed in the National as he was racing harder and gaining some good ground until suddenly his car stopped dead! A big puff of smoke followed by Frankie’s car coming to an emergency stop! I cringed knowing what was about to come. 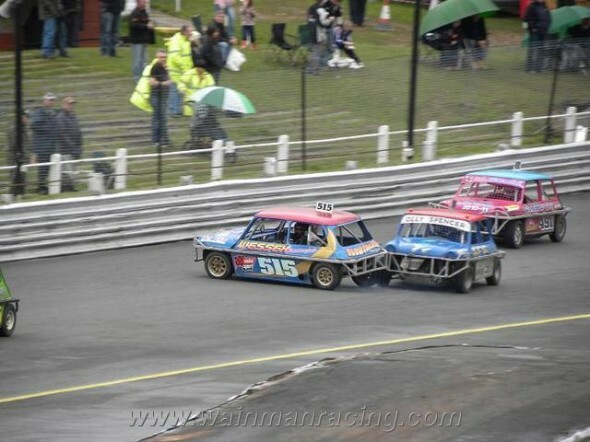 Because of the smoke, James Riggal didn’t see him and hit him flat out! The race was stopped straight away. Frankie JJ was a bit winded but soon got out of his car. James was also very sore. The impact was that hard James crotch strap snapped – enough to make a grown man’s eyes water! 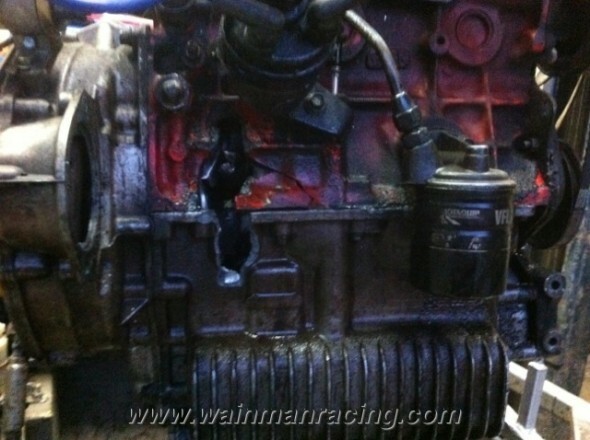 Frank’s crank had broken and his engine is completely destroyed! On a positive note, both lads are okay and only had 1 day off school! 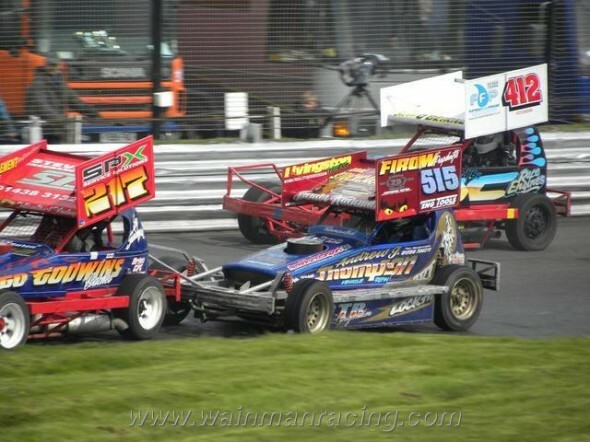 It was a bit strange for me watching him get such a big hit because it was 5 years to the day I had my Hednesford roll. So both young Frank and Danny are limping about but I have another race! Once again I get a good result, thirdplace. Didn’t win anything except the Grade Award for being the highest superstar points scorer! We head off for home, it’s been a long expensive weekend!